When you go grocery shopping, do you feel like you are spending money or saving money? If your answer is "spending" money, then it's time to change how you shop. This article will guide you through understanding how "Shop to Save" strategies are the most important elements in drastically reducing how much you spend on food and other household and personal products. Before I started using coupons, I was a terrible shopper. Grocery shopping was a chore, usually tagged on to other errands or when I was tired and hungry on my way home from work. I would do a slow jog (not walk) down the aisles, grabbing whatever package looked like it had the best food inside of it. I was a sucker for all the ploys used at grocery stores to keep me from looking at the prices, like packaging design and product placement. And most of the time, my basket of groceries cost as much as my car note. After a career change, when money was anything but disposable, I realized I had to adjust how I approached grocery shopping. The prices on products became my main focus and would determine if or how many I would buy. 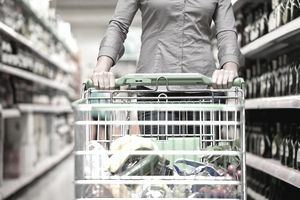 If your goal is to put a huge dent on how much you are spending on groceries, you may also need to change your shopping habits, but first, you have to identify why you buy what you buy. Shoppers that are brand loyal and habitually buy the same products without looking at price. Shoppers that like to try new products and keep a variety of brands on hand. Price is secondary. Shoppers that like to buy trendy "designer" products like exotic flavored waters and could care less about price. Shoppers that buy products based first on price. If you identify more with any of the groups other than the last one, then you will need to change if you want to reduce your grocery spending and immediately start saving (a conservative) 30 to 60 percent off your bill. Real bargain hunters, like those that you see boasting about saving gobs of money at the grocery store, focus first on the prices of the products that they want to purchase. If a product is not priced low enough, even when they have a coupon for it, it goes back on the store shelf. However, if an item has a rock-bottom price and it is a product that will get used within a reasonable amount of time, good bargain hunters will jump on it and purchase the item in bulk. It will then be stored in their stockpile and used over time, but at a substantial savings compared to what it would have cost at full price. By shopping this way, bargain hunters rarely shop for essentials out of need, which is when the chances of paying regular price (which I call throwing money away) increases. Jane is doing her weekly shopping and finds Dove Body Wash on a closeout sale for $2.00. The regular price is $5.75. She and her two daughters use body wash regularly. Instead of buying just one or two, she decides to buy 10, which will cost $20. Had she bought them at a regular price she would have spent $50.75 over time. However, because she bought them on sale in bulk, she has spent $30.75 less on shower essentials and she has enough products so she can wait to buy more body wash the next time she can get them at cheap prices. When checking out, Jane applies six coupons she has saved for $0.50 off Dove Body Wash. She redeems the coupons and saves an additional $3.00 off her bulk purchase, which has now increased her savings to $33.75. The final price she pays for each body wash: $1.70 (Regularly priced at $5.75). If you want to find the really deep discounts at the supermarket and at drugstores, do not expect to find them listed in the weekly sales circulars. This doesn't mean that you should stop looking at the circulars. There will still be bargains that warrant your attention, but for the super cheap, discontinued and rock-bottom priced products, you will need to do some digging around the corners and bottom shelves of your stores. You may be wondering how people know when they are getting the lowest or most acceptable prices when there are so many different products in the stores. Lucky for us, there are helpful methods to keeping up with all of it, and memorizing prices is not required. One way some couponers keep up with prices is by keeping a price book. A price book is a simple and basic system that helps shoppers track the prices of their favorite products to help determine what is a good deal and what is not. It can also help to track the pricing cycles (more about that below) of products that they want to purchase. Considered a somewhat dated method of knowing the high and lows of food pricing, price books are still a very valuable tool for some couponers. In our article, "Price Books - The Easy Tool for Saving Money," we explain in detail about how and why people use them and how to create your own. There are also templates that you can use to get started. With the growth of online couponing forums and discussion groups, more couponers are turning to the internet to find pricing information and to discuss pricing with each other. There are several online sites that keep shoppers informed when products are on sale and some include the percentage of your markdown savings per item. Also, a fairly new tool for the world of grocery store bargain hunters are the phone applications that offer price comparisons on products by brand and actually help you find the store in your area that has the lowest prices on products. We discuss both the internet discussion groups, price-comparison sites and the phone applications in more depth later in Step 8. Generally, food prices drop to the lowest amount based on a 12-week cycle (sometimes less depending on where you live). Unless there is an essential that you must have immediately, try to wait for the 12-week cycle on products to roll around so that you buy them when they are at the cheapest prices. When possible, save and use your coupons on products that are reduced. When you find products at the lowest prices, buy what you can afford, need and what will be used within a reasonable amount of time. Don't forget to use what you own. As soon as you start using Shop to Save strategies, you will begin saving money on your grocery, personal and household purchases. Buying Food in Bulk - How Long Will It Last?